First Line: "No one ever told me that marriage was murder," Olivia Limoges complained while pouring cream into her coffee. Olivia and her new husband Chief Rawlings decide that they need a honeymoon, so they head to Palmetto Island. There they can enjoy some alone time before they're joined by the rest of the Bayside Book Writers for the Legends of Coastal Carolina Festival. The highlight of the festival is undoubtedly going to be Silas Black, a screenwriter and producer who's put his own spin on coastal Carolina's history and turned it all into an extremely popular television series. Once the festival starts, it seems that someone is bringing local ghost stories to life in increasingly more dangerous ways. When the body of a woman close to Silas Black is discovered on the beach, it's up to Olivia, her husband, and her friends to identify the killer before another life is claimed. Ellery Adams' Books by the Bay series has long been one of my favorites for the plots, the three-dimensional characters, the local history, the mouth-watering food, and the insights into a writing group each book has provided. In Writing All Wrongs, Olivia and Rawlings have a problem or two to iron out in their brand-new marriage, and Olivia has another chance to come to terms with her biological father. Adams once again does a superb job in showcasing the history of the North Carolina coast. (It's certainly rich enough to fuel hundreds of crime fiction plots.) There's also a spine-chilling sense of dread throughout the scene involving the opening of a bookstore. I have to admit that there were a couple of things I missed. 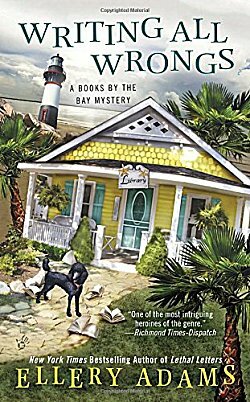 The Bayside Book Writers were primarily sleuths in this book, and I did miss their meetings. I've found it fascinating to learn what can go on in groups like this-- from developing an idea to writing a book to actually getting it published. Scarcely any mention was made of Olivia's new book, although to be honest, the woman didn't have time to pick up a pen let alone do any writing. Another thing missed? I've come to look forward to descriptions of mouth-watering meals in this series, and they were scarcely to be found here. The suspect list is a long one in Writing All Wrongs, the plot threads are many, and everything was concluded in a bit of a rush at the end. It felt a bit perfunctory, as if this book could very well have been the last. Fortunately I know that it isn't. Although this particular book may have a few little flaws, it is very enjoyable, and I still give this entire series my strongest recommendation. Yes, that would be the best thing to do, Margot. It's definitely a series in which you want to experience the road Olivia travels to get to this point.